The Speaker of Parliament – Lord Fakafanua is currently in New Zealand as officials of the New Zealand Parliament, together with a delegation of MPs and officials. 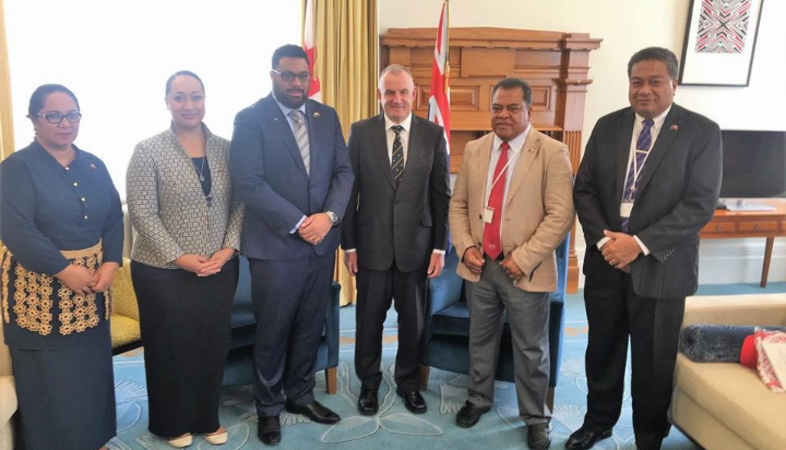 They are the first Pacific Parliamentary Delegation that have been invited by the Speaker of the New Zealand House of Representatives Rt Hon Trevor Mallard. Lord Speaker acknowledged the continued generous support given by the New Zealand Parliament and New Zealand Government to the Kingdom of Tonga. The two Speakers re-affirmed the long-standing and strong relationship shared by the two nations and their commitment to continuing and strengthening that relationship. A key focus of their talks was on the rebuilding of the Legislative Assembly infrastructure following the destruction of Parliamentary Chambers by Tropical Cyclone Gita- an exercise that New Zealand and Australia are committed to carrying out. The two Speakers re-emphasized that this visit would prompt opportunities to explore the possibility for more information sharing, study exchanges and working together to learn about parliamentary best practices given the recent Constitutional reforms in Tonga in 2010. The meeting was concluded by the Speakers re-emphasizing that their two Parliaments will remain committed to strengthening their friendly bilateral relations. Lord Fakafanua’s delegation includes Lady Fakafanua, Minister of MEIDECC -Hon Poasi Tei,Ha’apai 12 MP – Mo’ale Finau, Chief Clerk of the Legislative Assembly of Tonga Gloria Pole’o and a support staff.